We got acquainted on the web. One editor to another. Karen Schmit, retired NWA Flight Attendant, edits the wonderfully successful NWA Flight Attendant monthly newsletter, BITS AND PIECES. Anne Kerr edits Reflections, newsletter of the NWA History Centre museum. From time to time, these editors have shared information for publication in their respective newsletters. 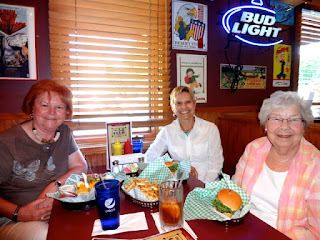 Happily, On June 6, 2012, the two e-mailing editors finally met face-to-face, joined by Karen's good friend and retired NWA F/A Shirley Hoiby. Anne preceded these two at Northwest Airlines by a couple of years :-) and suggested the 5-8 Club for lunch. The 5-8 was THE airline hangout at the airport when Lady Skywriter was a stewardess in the late 1950s. However, after she had to resign to get married (!) the terminal building moved from 34th Avenue to the other side of the field, and access to the 5-8, at 58th and Cedar Avenue, became an issue. Anne is told that for a limited period of time, folks drove across the field to get to the 5-8 - until the authorities intervened. The burgers are still just as tasty - and the clientele just as interesting (lots of airport workers, mostly military) and the 5-8 Club history just as titillating. It was a speakeasy during prohibition in the very same structure at the very same spot. See the current issue of BITS AND PIECES for details. After lunch, Lady Skywriter introduced Karen and Shirley to the NWA History Centre at 81st and Cedar in Bloomington, where they saw some folks they knew, working on a mailing and volunteering at the Centre. 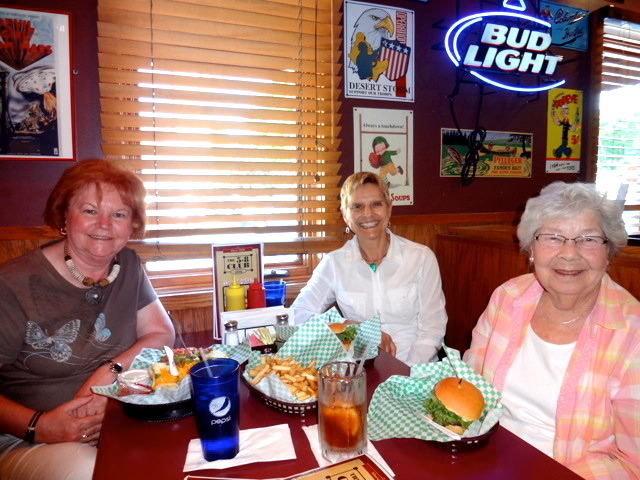 It was wonderful to meet Karen in person, with the bonus of meeting her (senior) friend Shirley Hoibe.